Your Are Here → Home → Classes → Learn to quilt! Beginning Quilting What a perfect opportunity to learn an fabulous art, that can be handed down through the generations. The quilts you make will be passed to others, and your talents will be known with them.. what better way to give your love! Check out the calendar for the dates and times – We hold the classes on Wed night and Saturdays. 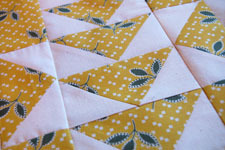 These classes are 5 week sessions that take you from the beginning to a finished/bound quilt.